The Beauceron is a herding dog breed from France. It is also known as the Berger de Beauce, the Bas Rouge, or the French Shorthaired Shepherd. The breed can stand up to 70cm and weigh 35kg. Their colouring is either black and tan, black, or harlequin; other colours (tawny, grey, and grey/black) once prevalent are now banned by the breed standard. The coat is short, close and smooth, except on legs, tail and flanks where there is a slight fringe. A very versatile breed, the Bas Rouge (Red Stocking) was once used to hunt wild boar. It served in both World Wars as a messenger dog, a supply transport dog, and in detection of mines and rescue of the wounded. 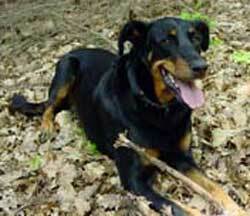 In addition, the Beauceron has strong herding traits and capability. This muscular and energetic breed is described as intelligent, calm, aloof, and very protective of children.